Schmidt&Bender Klassik illuminated 8x56 is a traditional European riflescope for traditional european rifles. It has proven it self as the best choice for low light hunting and the first choice for this kind of use. 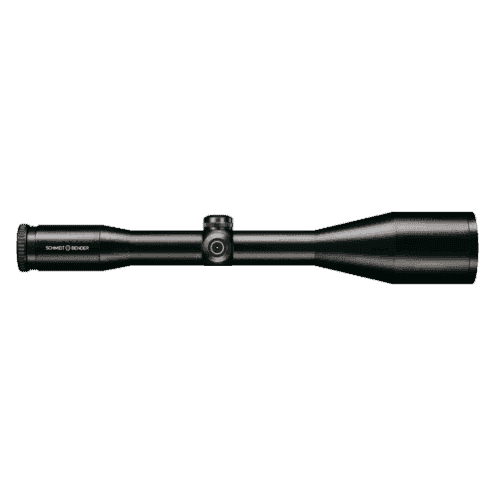 Schmidt&Bender Klassik illuminated riflescopes, with the illuminated reticle feature, are classic riflescopes with variable magnification and a robust housing. Because of the illuminated reticle they are primarily intended for night time hunting but not also for day time hunting with illumination as are Schmidt&Bender Zenith FlashDot riflescopes. The reticle is seated in the first focal plane and will change in size according to magnification. All Schmidt&Bender Klassik illuminated series riflescopes are waterproof and filled with dry nitrogen for easy use at low temperatures. All lens surfaces are multi coated and the construction ensures safe use on even the most powerful hunting rifles. Schmidt&Bender Klassik illuminated riflescopes have a warranty period of 10 years and an additional 20 years guarantee for service and maintenance. Reviews for Schmidt & Bender Klassik 8x56 Illum.